Every impeccable detail of this beautiful medium weight jacket, from the long sleeves to the narrow lapels, was created to bring out the natural beauty of its wearer. The simple design looks chic and classy. 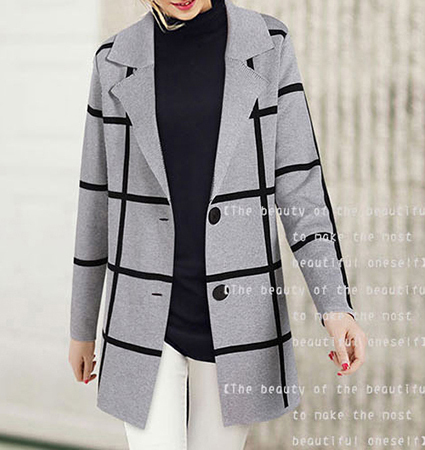 The jacket is presented in a neutral gray with black windowpane checks overall. The solid color lapels are notched and form a small collar. Two widely-spaced, black buttons offer front closure. This jacket has two slit pockets located on each side. We recommend dry cleaning only for this garment. It is available for purchase in sizes Small, Medium, Large and Extra Large.